I am a 15-year-old student at Hurstpierpoint College, Sussex, where I play a term of Rugby, a term of Hockey and a term of Cricket. 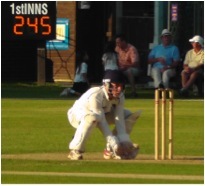 I also represent Sussex at Cricket, where I have played for the last 3 years as a wicket keeper / batsman. I developed a pain in my right knee early in January 2012 as our Hockey term started, and this became progressively worse each game I played. In early February, I stopped playing Hockey and sought advice from Mr McDermott and his colleagues, in London Sports Orthopaedics. I had an MRI scan at a local facility a few miles from my home near Sevenoaks followed by consultations in Northwood. I ended up having arthoscopic surgery on 4th April 2012, to remove a medial plica and to tidy up some articular cartilage damage on the back of my kneecap. Having had a general anaesthetic, I was able to see the full procedure on the DVD that Mr McDermott recorded for me, and could see the cause of my original pain: rough areas of damaged cartilage that was beginning to come away from the joint surface. These were trimmed and made smooth again with a tiny probe. I was worried that the injury would badly disrupt the most important part of the year for me as a cricketer… the summer season, which starts at the end of April. I ended up missing just 1 game and was back playing for Sussex U15 by mid-May, only 44 days after my surgery. After a very wet June, I have played a lot of cricket and have not felt any pain at all. I will also be representing Sussex Academy on their three-week tour to Cape Town this December … a trip that would not have been possible six months ago. I am really happy to have had the surgery and recovered quickly. I must thank Mr McDermott for his care and skill to get me back on my feet playing the sport that I love!